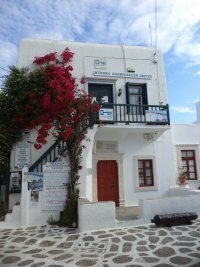 Luxury gay hotel located near the Chora of Mykonos (gay hotel mykonos near town), has rooms, studios, apartments and a villa. 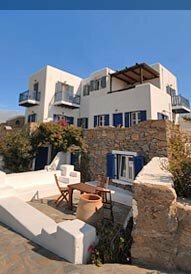 The gay hotel is built in traditional Cycladic style is the best gay hotels in Mykonos for the community. Geranium are an exclusively gay man hotel in Mykonos. The elegant rooms are equipped with satellite TV and minibar, and each has a spacious bathroom with bathtub. From their private terrace guests enjoy breathtaking view of the Mykonos bay. The pool area features free sun loungers for guests to relax while enjoying the views. There is a pool bar that serves cocktails and snacks. A rich breakfast with homemade products is served daily. 24-hour room service is offered. The hotel offers shuttle service to and from the port and airport. A bus stop with frequent service is just opposite the hotel offering great connection to the island's beaches. Staff at the 24-hour reception can offer travel information and arrange car and bicycle rental. Free private parking is possible at Hotel Alkyon. "Gay friendly"
Opening times: 9am - 9pm daily. Villa Konstantin Hotel Apartments and Studios in Mykonos Town is a family run Bed and Breakfast holiday complex located high up on the Northern hillside about 700 meters from Mykonos Town the very picturesque capital of Mykonos Island. Villa Konstantin offers a wonderful view of the Aegean Sea. We are not a hotel. Appealing to people who are looking for a 'home away from home' atmosphere and wonderful hospitality. Villa Konstantin in Mykonos is one of the most inviting places to stay near town. "Gay friendly"